A 4.17% total price difference after 7 years? Yesterday (11th Feb 2018), DAP Secretary General Lim Guan Eng held a press conference to demand the BN Federal government to take Mydin’s claims seriously saying that Low-income earners are worst hit when prices of basic goods increase. “We want the government to come up with measures to fix this urgently. This is a big issue,” Guan Eng told reporters at Komtar. As usual, Lim Guan Eng made wild claims that prices have increased steeply for the lower-income group but he does not offer any evidence. 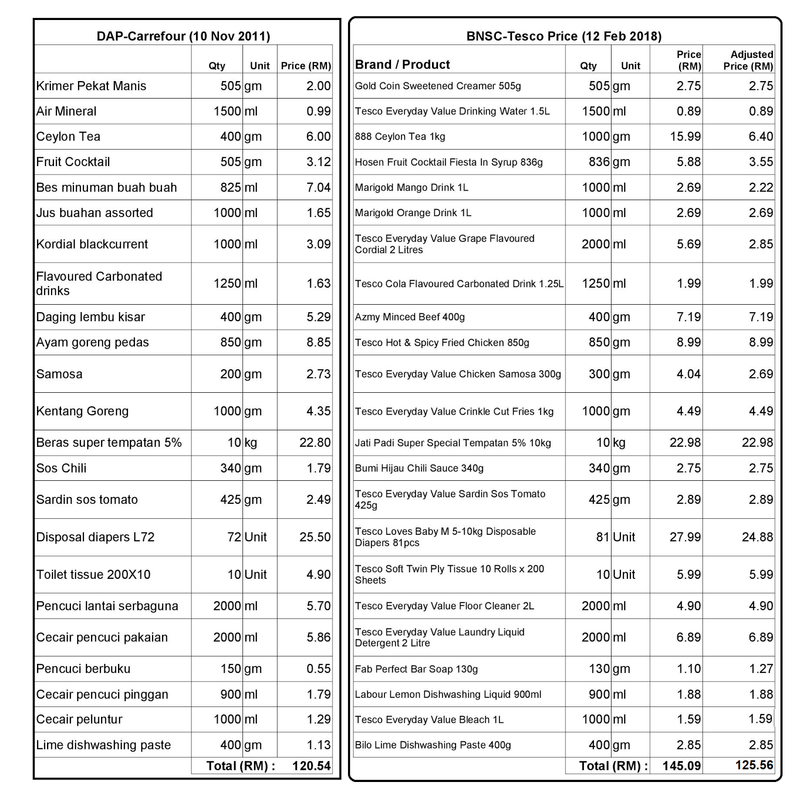 Although BNSC does not dispute that there may be price increases for certain items, we dispute that all prices for a typical shopping list have increased as much as DAP and Pakatan claims. Therefore, BNSC decided to do a comparison. Since obtaining historical prices for groceries that cannot be disputed by DAP is difficult, we did the next best thing: We used DAP's own figures! We obtained DAP's own groceries list that they themselves published on their publicity chief Tony Pua's blog more than 6 years ago on 10 Nov 2011 when DAP's relationship was not as rosy as yesterday. DAP had done a comparison between the groceries prices for the then Kedai Rakyat 1Malaysia (KR1M) with products that they had sourced from Carrefour to proof that KR1M prices then were not that much cheaper than elsewhere. At that time, DAP said their shopping basket primarily sourced from Carrefour's adjusted total cost RM120.53 versus the same basket from KR1M which totals RM130.49. The comparison then led to a series of arguments in the media at that time between DAP and Mydin. Today, BNSC did a quick session of virtual shopping on Tesco Malaysia's online shopping platform at https://eshop.tesco.com.my/groceries/en-GB (since Carrefour is no longer operating locally). Tesco claims that the prices on their shopping website includes the 6% GST and is the same as the prices as you will find in their stores. As product packaging changes and stores do not always carry the same products, matching products and the product's quantity is impossible, Therefore just like what DAP did in 2011, we also adjusted the prices for some items to match the quantity listed in DAP's list. We were also compare to match the brand and quantity of the products we chose with what DAP had chosen then as closely as possible. 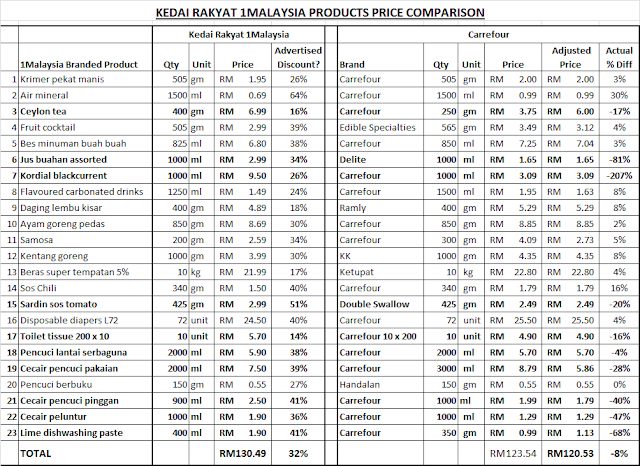 Here is the result of our comparison shopping as at 12th Feb 2018) versus DAP's list on 10 Nov 2011. After adjusting for quantity, the total prices of items from TESCO on 12 Feb 2018 is RM125.56 (including GST) - or 4.17% higher than DAP's total calculated price of RM120.54 more than 6 years ago on 10 Nov 2011. A 3.5% increase in 6 years based on DAP's list is certainly much lower than what the DAP Secretary-General had accused yesterday. BNSC is also surprised that the price difference after so many years is minimal. Could this be due to more variety of products in the market leading to more affordable alternatives or is this due to increased competition among hypermarkets that has pushed some prices down? We cannot be sure. Again, we stress that we do not dispute that the price of some goods may have increased since 2011 - as with any country in the world - but this best effort comparison uses publicly available price based on DAP's own list of goods. Therefore, we invite DAP to go through our shopping list to determine if we have made any substantial mistakes in our products selection that could have led to significant differences with DAP's Carrefour generic products selection then. DAP is also more than welcome to correct our list so that we can determine together what the actual price increase of their 2011 basket of goods is today. The following is our online shopping trolley which we printed from the TESCO Malaysia online shopping site. It includes full product description, photos and their prices. (Ignore the service fee, as it is for delivery services). Eric See-To and the BNSC Team. Kami menawarkan pinjaman dari jumlah minimum sebanyak 50,000.00 hingga 20 juta Euro, Dolar & Pound-sterling di REBECCA WILLIAMS LOAN FIRM. Adakah anda sedang mencari pinjaman untuk semua jenis tujuan, Pinjaman Perniagaan, Pinjaman Peribadi, Gadai Janji, Pinjaman Kereta, Pinjaman Penyatuan Hutang, Pinjaman Tidak Bercagar, Modal Risiko, dan lain-lain ..
Anda berada di tempat yang betul Penyelesaian pinjaman anda! Saya seorang pemberi pinjaman swasta yang meminjamkan Individu dan Perniagaan pada kadar faedah yang rendah dan berpatutan kadar faedah 2%. Jaminan 100% untuk pelanggan yang serius.